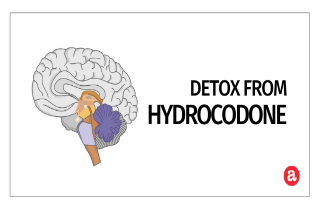 A full guide to hydrocodone detox protocols here. ARTICLE OVERVIEW: This article reviews symptoms of hydrocodone withdrawal and when to expect them in the detoxification process. Then, we invite your questions at the end. Hydrocodone is a part of the opioid family of painkiller drugs, a man-made narcotic. Opioid medications have the potential to provide significant pain relieving benefit for people when used as directed. However, opioids also carry serious risks of misuse, abuse, dependence, addiction, overdose, and death. Opioids like hydrocodone work by flooding opioid receptors in the brain, which is why you experience blocked pain, and increased serotonin that gives you a relaxed and pleasant feeling throughout the body. In other words, it works by changing the way the brain and nervous system respond to pain. Dependence can develop after only a few weeks of using hydrocodone daily. The body adapts to the presence of hydrocodone and becomes part of the normal functioning. But when you stop taking hydrocodone, withdrawal symptoms manifest. During this time, the body struggle to regulate itself without the presence of hydrocodone. Symptoms occur as the brain reorganizes chemical messages to achieve balance. Cold flashes with goose bumps. Deficits in executive control functions. Hydrocodone withdrawal symptoms can develop a few minutes or hours after you miss an expected dose, and peak 12–48 hours after that. In fact, you can expect to feel hydrocodone withdrawal begin shortly after a missed dose. The degree and time that withdrawal takes, however, can fluctuate given your daily dose frequency and amount. Hydrocodone detox usually subsides over the course of 10–20 days. However, after you have battled the physical effects hydrocodone withdrawal, you will have to deal with the psychological craving for the drug and kicking the need to take it again when stressors arrive. Also, symptoms like depression or trouble sleeping can linger. This could take up to 6 months or longer to resolve. Hydrocodone withdrawal start between 6 and 12 hours after the last dose. Usually, symptoms peaks within 72 hours and can last anywhere from a week to a month.Drug cravings and some of the emotional side effects may last longer than a month without the help and support of a mental health specialist. The amount of time you’ve been using hydrocodone, as well as the average dose and exact formulation of the drug may make a difference in the precise withdrawal timeline and severity. The longer a drug is taken, the more intense the withdrawal. Also, it may be likely that significant physiological dependence has developed. Underlying medical or mental health issues can also prolong the process. Opiate withdrawal is typically not life threatening, but it can be very uncomfortable. However, the most dangerous part of withdrawal is the threat of relapse. For long-term users, relapse after withdrawal can be deadly. Many persons who want to partake of the drug “just one last time,” will consume it at the normal rate they tolerated prior to withdrawal. Because the drugs are out of their system, this amount can prove too much for the brain to handle. Many people overdose because of this. Bluish color to lips and nails. Pale skin, especially in the face. Severely reduced or stopped breathing. If the person has stopped breathing or if breathing is very weak, begin CPR. Make sure that your family members, caregivers, or the people who spend time with you know how to tell if you are experiencing an overdose and what to do until emergency medical help arrives. You will probably be unable to treat yourself if you experience an opioid overdose. Naloxone is a medication used in treating opioid overdose. Naloxone is a medication approved by the Food and Drug Administration (FDA) to prevent overdose by hydrocodone. It blocks opioid receptor sites, reversing the toxic effects of the overdose. It´s administered when a person is showing signs of opioid overdose. The medication can be given by intranasal spray, intramuscular (into the muscle), subcutaneous (under the skin), or intravenous injection. Yes, you can go through hydrocodone detox on your own, especially if you have just started taking it and you know which hydrocodone withdrawal symptoms to expect during detox and for how long. However, for others who have taken hydrocodone for more than a few weeks, medical supervision is strongly recommended to manage tapering, because drug cravings make it harder to deal with withdrawal symptoms. A medical detox clinic is the best place to go through hydrocodone withdrawal. This medical setting creates a safe environment to manage uncomfortable symptoms of withdrawal. A supervised detox can prevent potential complications. Some treatment centers follow the philosophy that they should not treat a drug addiction with other drugs, but research shows that medication can help in many cases. FDA has approved a number of drug products that address opioid addiction or overdose. Methadone, buprenorphine, and naltrexone are used to treat opioid dependence and addiction to short-acting opioids such as hydrocodone. People may safely take medications used in MAT for months, years, several years, or even a lifetime. Plans to stop a medication must always be discussed with a doctor. Methadone has been used for decades to treat people who are addicted to narcotic pain medicines. When taken as prescribed, it is safe and effective. Methadone tricks the brain into thinking it’s still getting the abused drug. In fact, the person is not getting high from it and feels normal, so withdrawal doesn’t occur. Persons taking methadone to treat opioid addiction must receive the medication under the supervision of a physician. The length of time in methadone treatment varies from person to person. According to the National Institute on Drug Abuse publication Principles of Drug Addiction Treatment: A Research-Based Guide – 2012, the length of methadone treatment should be a minimum of 12 months. Some people may require treatment for years. Even if a person feels that they are ready to stop methadone treatment, it must be stopped gradually to prevent withdrawal. A doctor should supervise such a decision. Like methadone, buprenorphine suppresses and reduces cravings for the abused drug. It can come in a pill form or sublingual tablet that is placed under the tongue. 1. The induction phase is the medically monitored startup of buprenorphine treatment. The medication is administered when a person with an opioid dependency has abstained from using opioids for 12 to 24 hours and is in the early stages of opioid withdrawal. 2. The stabilization phase begins after a person has discontinued or greatly reduced their misuse of the problem drug, no longer has cravings, and experiences few, if any, side effects. The buprenorphine dose may need to be adjusted during this phase. 3. The maintenance phase occurs when a person is doing well on a steady dose of buprenorphine. The length of time of the maintenance phase is tailored to each person and could be indefinite. Once a person is stabilized, an alternative approach would be to go into a medically supervised withdrawal, which makes the transition from a physically dependent state smoother. Naltrexone blocks the euphoric and sedative effects of drugs such as heroin, morphine, and codeine. It works differently in the body than buprenorphine and methadone, which activate opioid receptors in the body that suppress cravings. Naltrexone binds and blocks opioid receptors, and is reported to reduce opioid cravings. There is no abuse and diversion potential with naltrexone. It is important that medically managed withdrawal from hydrocodone be completed at least 7 to 10 days before extended-release injectable naltrexone is initiated or resumed. Research has shown that naltrexone decreases reactivity to drug-conditioned cues and decreases craving. These are recommendations for the treatment of these common symptoms, but remember that if you have any of these symptoms, it is always best to consult a doctor first, before self-medication. Do you have questions about hydrocodone detox? Would you like to know more? Please ask any questions you may have here in the comments section and we will get back to you personally and promptly.